It's the British Style in vogue this Winter and GuidoMaggi presents the new "King's Road" elevator derby shoes. The upper, in fine black full grain leather, it is meticulously handcrafted and punched by hand to draw the refined English design. The comfortable inner lining is made of soft goatskin. Stylish and ultra resistant is the tank thread outsole made of natural rubber handcrafted, with anti-slip. The inner height increaser of the King's Road, according to needs, can be selected between: 2.4, 2.7 and 3.1 inches. GuidoMaggi's artisans and designers allow customization to make the shoe even more unique. 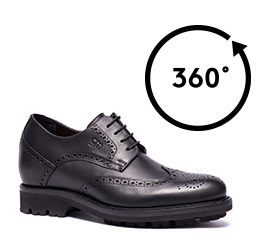 Perfect for formal occasions, the King's Road can still be matched with more casual outfits.